1. Cropped version of a colorized portrait available via Wikimedia Commons; source here. We're interrupting our normal weekend schedule on the blog for some very important jewelry: the baubles worn by the ladies of the principality of Monaco this Saturday at the annual Bal de Rose! The annual charity ball, which benefits the Princess Grace Foundation, had a rather timely Russian theme this year, and the event drew a number of bejeweled guests -- including one jewelry-phobic princess sporting some major bling. Enjoy this photo recap, and let us know in the comments which jeweled look you liked best! Princess Charlene wears jewelry! Specifically, these are the earrings that coordinate with the Ocean Tiara, a wedding present made by Van Cleef & Arpels. Of all the diadems in royal vaults, the regal tiaras created by Mellerio dits Meller frequently rank as favorites among the tiara lovers of the world. Today’s diamond and pearl tiara, the Mellerio Shell Tiara, is one of the most unique sparklers ever created by the jewelry house. 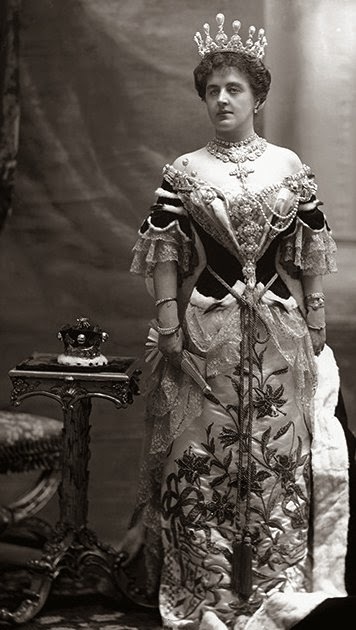 Made in 1867, the shell tiara was purchased by Queen Isabella II of Spain the following year as a wedding present for her daughter, Infanta Isabella (pictured above). While Mellerio's headquarters were (and still are) based in Paris, they opened a branch in Madrid in 1850 and subsequently became a favorite with the royals and nobles of nineteenth-century Spain. This particular Mellerio creation features drop pearls and diamonds suspended from a diamond-encrusted frame that is designed to look like a shell. (Others have also noted the tiara’s resemblance to a cresting wave.) The tiara can be worn with or without an additional diamond drop suspended from the center of the tiara’s base. Time for yet another roundup of this week's sparkliest royal jewels. Enjoy! 10. The Duchess of Cornwall made a visit to an East Sussex hospice on Wednesday, where she accessorized her outfit with a cheerful tortoise brooch. It's March, which means that state visit season is officially in full swing. The Swedes are visiting the Latvian president today, the Danes have recently had the Turks over, and the Dutch and Belgians have been hosting various leaders ahead of and in conjunction with the G8 conference. State visits are important political and diplomatic events, but they also provide us with an excellent opportunity to delight in a bit of royal glitter, as there is usually at least one white-tie event on the docket. Today, I've collected a group of photographs from Dutch state visits over the past few years. Marvel at the glamour of Queens Juliana, Beatrix, and Maxima, and consider this: if you could choose any jewels from the Dutch royal collection to wear (or look at) during a state visit, which set would you select? The present argument on the subject of the authenticity of the "Tiara Saitapharnes"  of the Louvre collection of antiquities is a renewal of the discussion which has been going on at intervals during the last seven years with more or less virulence. The tiara occupies a small window in a case in the Salle des Bijoux, being one of hundreds of ornaments shown. Owing to the doubts long existing, the ordinary guide books say that the authenticity of the tiara is disputed. The recent charges have emphasized these doubts, which promised to cast discredit on the entire collection, and the fine arts minister accordingly ordered an investigation for the purpose of protecting the good name of the Louvre. This has brought on a fierce controversy among the scientists concerning the tiara's authenticity, which some of the leading newspapers treat as being more amusing than serious. This evening M. Heron de Villefosse, the curator of the Louvre, published a letter denying having had dealings with Hochmam, a Vienna dealer, who was alleged to have sold the tiara to the Louvre. Theodore Reinach, who furnished the funds to buy the tiara, has also written a letter declaring that the doubts recently expressed are only reiterations of former aspersions, which do not affect his belief in the genuineness of the tiara. Le Figaro ridicules the controversy, pointing out that whether it is real or false the tiara is of trifling historical value. The result of the investigation is being awaited with interest, owing to the charges of the disputants that the fabrication of "antiquities" is being conducted systematically. Note: The Louvre was indeed duped -- the "ancient" headdress was a fake! 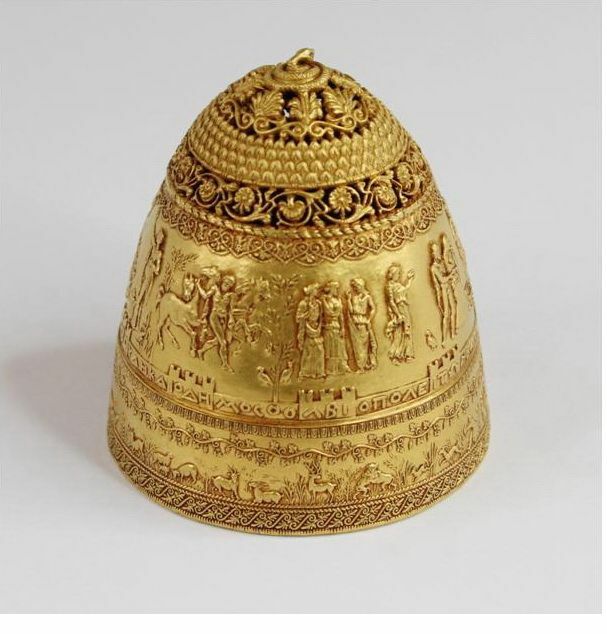 It was made in 1894 by Israel Rouchomovsky, a goldsmith from Odessa (in present-day Ukraine), who was told by the men who had commissioned the piece that the headdress was intended to be a gift for an archaeologist. 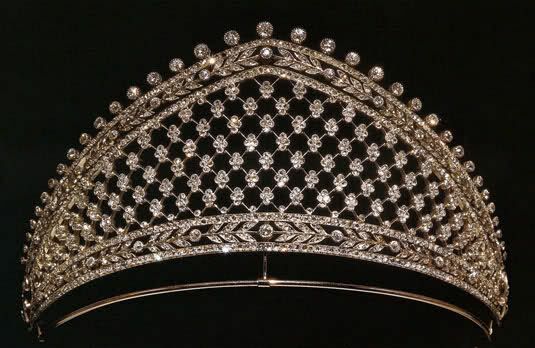 The tiara still in storage in the Louvre today, but it is taken out and exhibited occasionally as a part of retrospectives on Rouchomovsky's work. Rouchomovsky was an incredibly talented artist in his own right, and he's the one who revealed to the Louvre that the work was not authentic after he learned that the men who had commissioned it had passed it off as a a genuine ancient piece to the museum. On Saturday, the always-lovely Grand Duchess Maria Teresa of Luxembourg celebrated her 58th year on the planet. To add to the birthday fun, today I'm featuring some of my favorite glittering appearances made by Luxembourg's Cuban-born consort over the past few years. Enjoy the bling -- and be sure to register your vote for your favorite bejeweled look in the comments! The newly-minted grand duchess wore the pearl and diamond choker tiara at the wedding of Crown Prince Haakon of Norway on August 25, 2001; she's also wearing the Congo Diamond Necklace, which she wore as a tiara at her own wedding in 1981. A festive beaded necklace is an appropriate choice for the daytime portion of Luxembourg's National Day on June 23, 2005. ...and dark purple amethysts for the evening festivities later the same day! A stunning pair of statement earrings were perfect for a big royal bash in honor of her silver wedding anniversary at Berg Castle in July 2006. For a state banquet in Belgium on March 20, 2007, MT brought out some of the biggest jewels from the family's vaults: the Empire Tiara, an emerald and diamond choker that once belonged to Queen Astrid of the Belgians, emerald and diamond earrings, and an enormous diamond brooch. On the following day, during the same Belgian state visit, she sported this impressive turquoise necklace while visiting the Museum of Fine Arts in Brussels. A toast to King Juan Carlos of Spain on April 16, 2007, wearing the Belgian Scroll Tiara that was given to her mother-in-law as a wedding present in 1953. On April 16, 2008, she glittered in diamonds and sapphires, wearing the Grand Duchess Adelaide Tiara for a visit to the Nordic Museum in Stockholm. Wearing Grand-Duchess Josephine Charlotte's aquamarines at the pre-wedding dinner for Crown Princess Victoria of Sweden on June 18, 2010. Pearl drops on the ears and the lapel for National Day on June 23, 2010. Wearing the Chaumet choker tiara and pearl earrings at the pre-wedding dinner for her eldest son, Hereditary Grand Duke Guillaume, on October 19, 2012. Can you identify the jewels worn in this portrait by Empress Eugénie of France? Today, we're open-mouthed staring at one of the sparkliest Dutch tiaras of them all: the Stuart tiara. This whopper of a diadem includes one of the rarest and most historic diamonds in any royal collection, the Stuart (or Holland) Diamond. That single diamond alone weighs almost forty carats! The Stuart Diamond’s first recorded owner was a member of the House of Stuart (hence the name): Queen Mary II of England, wife and co-regnant of King William III (who was born William of Orange; he helped to overthrow his father-in-law, James II, in the Glorious Revolution of 1688). Mary and William purchased the diamond themselves after they married, and it was originally set in a brooch . The diamond went back to the Netherlands after first Mary and then William died. It actually returned to England, however, when a subsequent Prince of Orange went into exile. 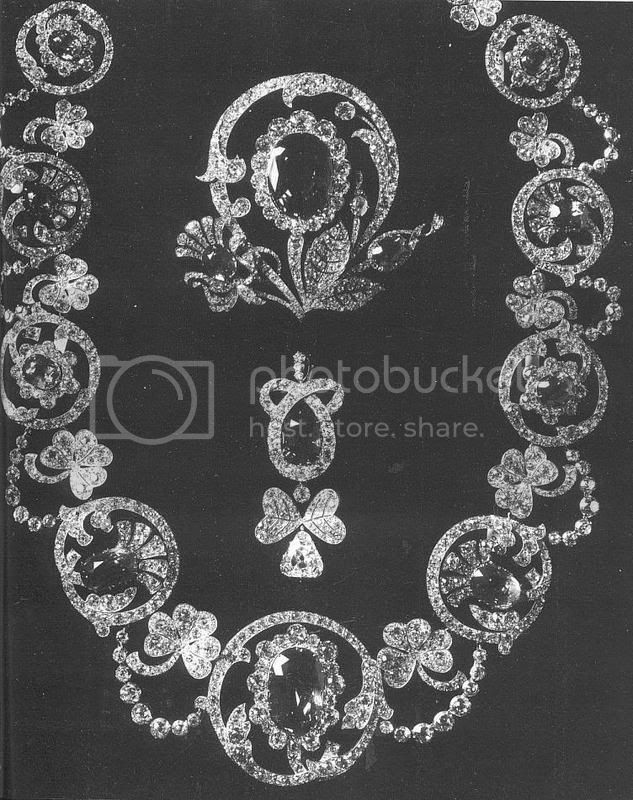 Queen Charlotte encouraged his wife, Princess Wilhelmina, to have some of the family’s jewels made over, and the Stuart was remodeled as a pendant necklace. Although the family was able to return triumphantly to the Netherlands by 1815, the stone came back to England one more time when it was displayed in London at the famous Great Exhibition of 1851. The Stuart Diamond wasn’t placed in a tiara until 1897, when Schürmann designed this tiara . It was ordered by Queen Emma specifically for the investiture of her daughter, Queen Wilhelmina. 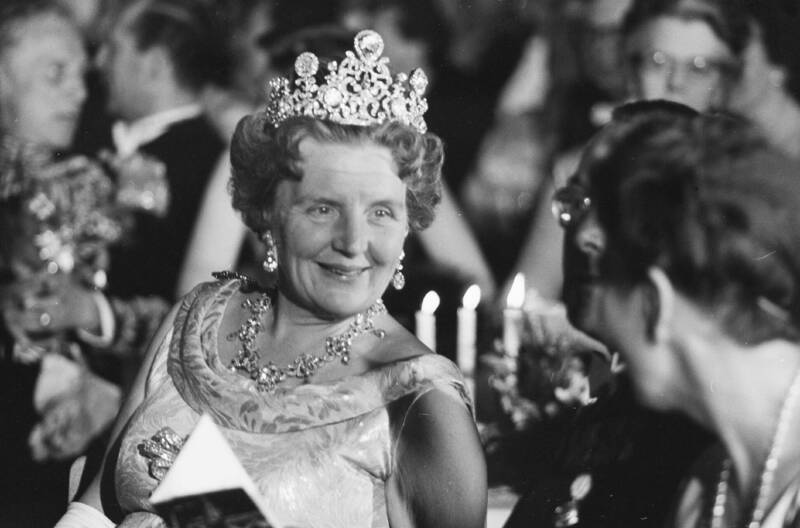 The queen who sported the tiara most often, however, was Queen Juliana. She’s also the last person to have been photographed wearing the tiara. In the picture above, Juliana wears the tiara at Windsor Castle during a 1972 state visit to the United Kingdom. 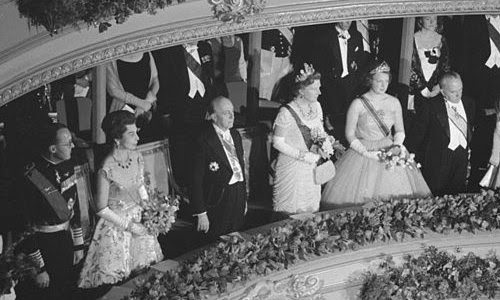 Neither Princess Beatrix nor Queen Máxima has worn the tiara in public. Some have suggested that alterations have been made to the rather enormous tiara to make it more wearable for a modern woman, but those rumors have apparently not been substantiated. Who knows? Perhaps Máxima, who is known for being adventurous with her jewels, will take this one out of the vaults at last . 1. 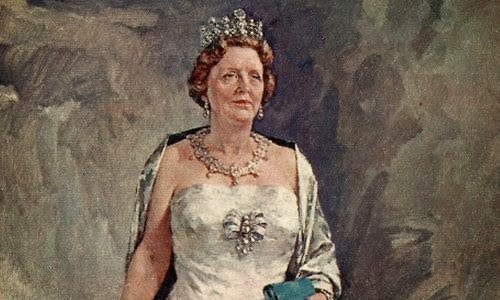 Detail of a 1962 portrait of Queen Juliana; source here. 2. For more on the Stuart/Holland diamond, see here. 3. John's website has much more on the creation of the Stuart Tiara and the House diamond parure. 4. A version of this post originally appeared at A Tiara a Day in May 2013. Time once again for a sparkly royal roundup! Here's a look at some of the biggest stories from the world of royal jewels this week. 10. Crown Princess Mette-Marit of Norway has kept her jewelry simple during her official visit with Crown Prince Haakon to Vietnam this week, generally sticking to a few stacked bracelets (including one that appears to have an "evil eye" motif) to add a bit of sparkle. 9. In Fabergé news this week: one of the bejeweled eggs given by Alexander III to Marie Feodorovna popped up again recently. It's worth a cool 20 million pounds! 8. On Friday, Queen Sofia of Spain wore her favorite strand of multi-colored pearls and a golden brooch to visit the "El Griego de Toledo" exhibit at the museum of Santacruz. 7. In Ghana, Crown Princess Victoria of Sweden has chosen more colorful jewels, including a playful pair of earrings for an engagement on Tuesday. 6. Queen Maxima of the Netherlands indulged in her penchant for purple once again this week, pairing oversized purple earrings with a coordinating chapeau. 5. As expected, the Duchess of Cambridge borrowed the shamrock brooch from the Irish Guards for the third year running on Monday; she wore it to present shamrocks to the regiment with the Duke. 4. If you're in Stockholm tomorrow, pop by the palace for a lecture on royal jewels by Göran Alm. The presentation will reportedly focus on jewels from the Renaissance to the present; check out the royal court's website for ticketing info. 3. Queen Elizabeth II also chose bright, spring-like colors for a visit to the University of London. She accessorized her blue ensemble with the Carrington Feather Brooch, which she received as a wedding gift in 1947. The piece features a sapphire nestled within the diamond feather, and it is sadly not named after Alexis Carrington, although she would certainly have worn it. 1. 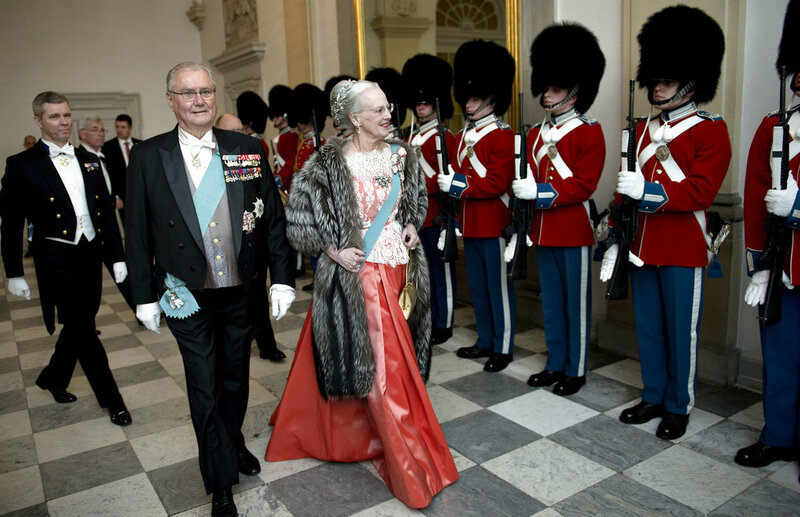 The always-dependable Danes brought out the glitter for their own state visit festivities this week, however. At a state banquet for the Turkish president, Queen Margrethe II wore the Baden Palmette Tiara, Crown Princess Mary wore her wedding tiara, Princess Marie wore Princess Dagmar's Floral Tiara, and Princess Benedikte wore the Star and Pearl Tiara (although she's mistakenly identified as Queen Anne-Marie -- oops!). Ain't no party like a Scandinavian tiara party! 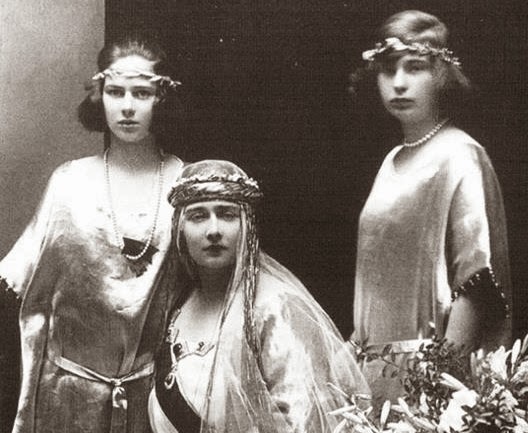 The wedding of King Alexander of Yugoslavia and Princess Marie of Romania will take place in the middle of July, according to information obtained today. 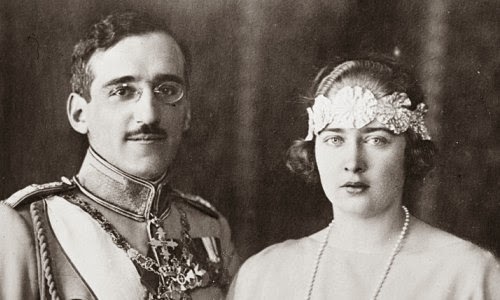 The wedding was originally set for May, but May is popularly regarded in Serbia as an unlucky month; so the King, although he is not superstitious, was obliged to defer to the general idea. The event was then fixed for June 4, but the Patriarch pointed out that this was a period of fasting for the Church. July then was finally agreed upon by the King and the family of the Princess . The Yugoslavs are immensely pleased with the match, which is considered a step in the direction of peace in the Balkans. Work is being rushed on the new Royal Palace in Belgrade so as to have it in readiness to accommodate such of the European monarchs and other notables as attend the ceremony. The royal couple will probably spend their honeymoon on the Dalmatian coast. 2. Princess Maria, known as "Mignon," was the daughter of King Ferdinand I of Romania and Princess Marie of Edinburgh (who was a granddaughter of Queen Victoria). 3. Cropped version of a photograph available via Wikimedia Commons; source here. 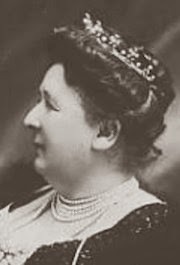 So far, we've seen diamonds and sapphires from the collection of Princess Victoria Melita, who was at various times during her life a princess of Edinburgh and of Saxe-Coburg and Gotha, a grand duchess of Hesse, and a grand duchess of Russia. 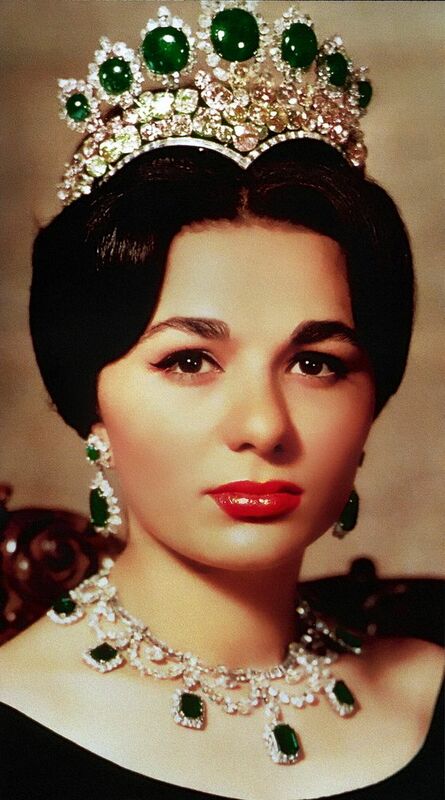 Today, we're going to shine the spotlight on the emerald tiara she wore on her first wedding day. The diamond and emerald tiara was a wedding gift to Ducky, either from both of her parents (the Duke and Duchess of Saxe-Coburg and Gotha, who were a British prince and a Russian grand duchess) or from just her mother. 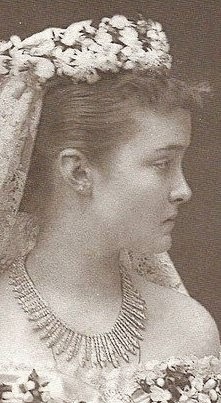 She wore the tiara on the day she married her first cousin, Grand Duke Ernst of Hesse, in 1894. The match was heavily promoted by their families, and even though they didn't dislike each other, some sources suggest that Victoria Melita was actually already smitten with her second husband (and cousin), Grand Duke Kirill Vladimirovich of Russia, before she married Ernie. Let's just say that there were warning signs that this royal marriage wasn't going to work out from the start. 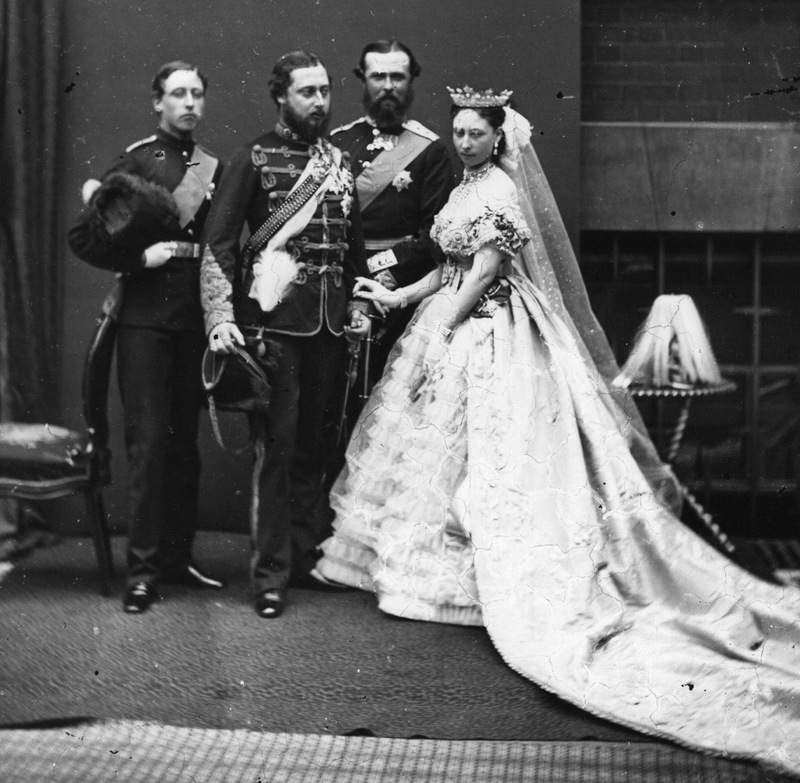 Regardless, the couple went through with the ceremony, much to the delight of their mutual grandmother, Queen Victoria. 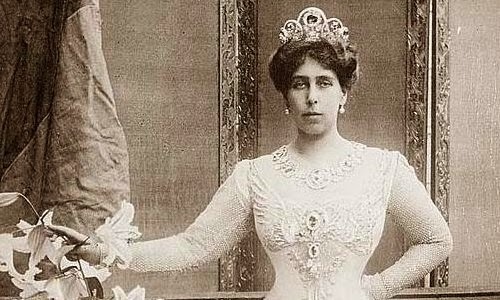 The bride's aunt Vicky (who was then the Empress Frederick of Germany) noted that Victoria Melita wore "a light slender diadem of emeralds with a sprig of orange blossom stuck in behind" as a bride, pairing the emerald tiara with a veil owned by the groom's late mother, Princess Alice . (You can see her wedding jewels in the photograph at the top of this post.) The emerald tiara is similar in design to an aquamarine diadem that belonged to Ernst's sister, Grand Duchess Ella; however, the two are distinct pieces. 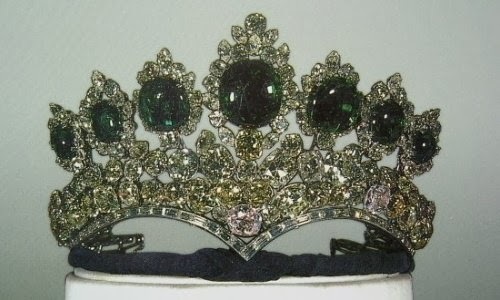 The emerald tiara was part of a suite of emerald jewels given to her by her parents on the occasion. 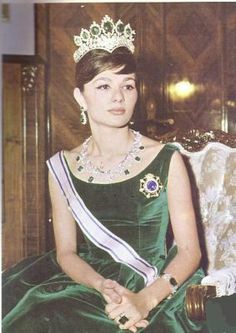 She also received a "necklace of pearls and emeralds" (which seems to be the necklace she wears in the photograph on the left above) and a "bracelet set with a large emerald" on the day . 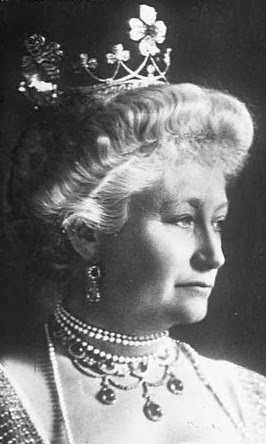 Although her marriage was not a success (for all sorts of complicated reasons), she continued to wear her wedding emeralds even after her divorce from Ernst was finalized in 1901. 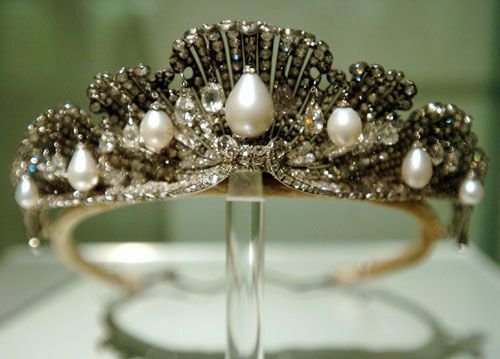 The tiara, along with many of the other jewels owned by Ducky's mother and sisters, was displayed in Coburg in 1903 as a part of a charity exhibition of the family's possessions . 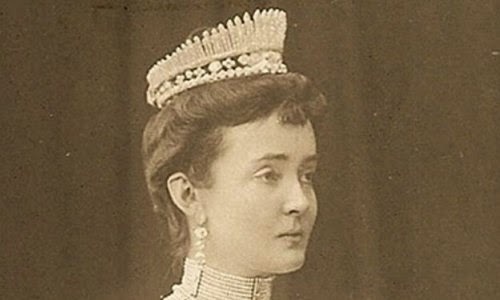 And she was also photographed in the tiara with her second husband, Grand Duke Kirill, which means that it was still in her possession in 1905. After that, it falls off the map. In her write-up on the emeralds, Ursula speculates Ducky had the tiara broken up sometime after her second marriage, using the stones to create a larger emerald parure. Ultimately, very few of Ducky's jewels are still around today, largely because the family had to sell many of their most valuable possessions after the Russian revolution. I think it's safe to say that her emerald wedding tiara has also left the family's collection, one way or another. 1. Cropped and edited version of the Hesse wedding photo, which is now in the public domain; you can see a full version of the photograph here. 2. Vicky's comment, made in a letter to one of her daughters, is quoted at Ursula's site. 3. Cropped version of an image in the public domain; source here. 4. Lists of Ducky's wedding gifts from the Illustrated London News and the Graphic are excerpted here. 5. 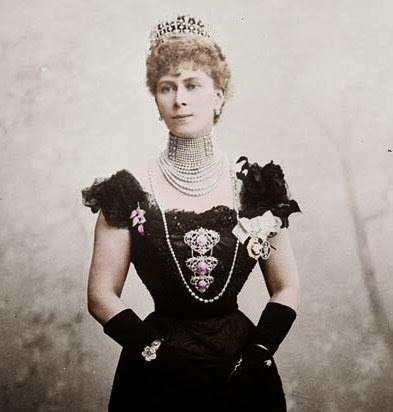 Ursula has a feature on the 1903 Coburg exhibition; you can see the emerald tiara here. Are you back yet? Okay, let's get to it! and star of the Order of St. Patrick. In 1783, King George III founded the Most Illustrious Order of St. Patrick. It was the highest order of chivalry in Ireland, and one of the triumvirate of national chivalric orders in the UK -- the English equivalent is the Order of the Garter, and the Scottish the Order of the Thistle. (And, as usual, none for poor Wales.) In precedence, it ranked below the Garter and the Thistle. The order was instituted as a means of encouraging loyalty to the crown in Ireland. Members of the order had to be men, and more specifically, men who were "knights and gentleman." (Women were never made members of the order. Only two women -- Queen Victoria and Queen Elizabeth II -- were ever included, and that's because they were both sovereigns.) Those who received it were recognized for their contributions to the Irish parliament. The only members ever appointed to the order already held noble or royal titles, generally Anglo-Irish peers and members of the royal family. Originally, the order was limited to the sovereign (the British monarch) and fifteen knights; George IV upped the number to twenty-one knights, and William IV formally capped the order at twenty-two. The order was conferred "at the monarch's pleasure" -- there were no "automatic" members. And unlike the Order of the Garter, royal princes counted toward the total number of members. The first member of the order was, however, a royal prince. 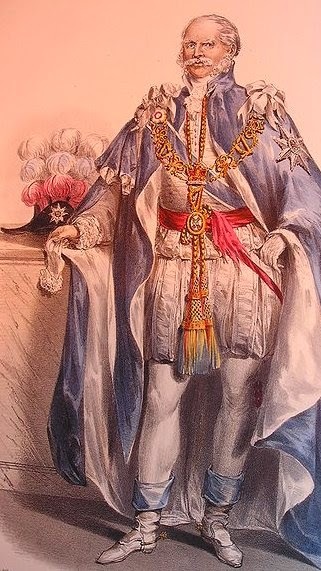 The fifteen original knights of St. Patrick were the Duke of Kent (father of Queen Victoria), the Duke of Leinster, the Earl of Clanricarde, the Earl of Westmeath, the Earl of Inchiquin, the Earl of Drogheda, the Earl of Tyrone, the Earl of Shannon, the Earl of Clanbrassil, the Earl of Mornington, the Earl of Arran, the Earl of Courtown, the Earl of Charlemont, the Earl of Bective, and the Earl of Ely . All knights of the order were entitled to append the letters "KP" after their names and titles. They were also entitled to be called "Sir," but as every member had a higher title, no one ever used that honorific. Members of the order wore mantles of sky-blue satin. 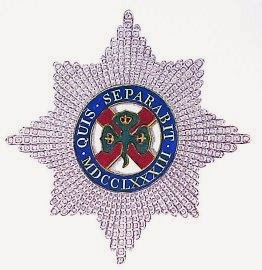 The insignia of the order consisted of an eight-pointed star , a broad riband (also in sky-blue), and a badge depicting a shamrock bearing crowns on each of its three leaves, encircled by the order's motto, "Quis separabit?" (Latin for "Who shall separate us?") and "1783" in Roman numerals. The badge was usually worn suspended from the riband, but on certain occasions , it was worn suspended from a bejeweled collar. The collar consisted of Irish harps and Tudor roses interspersed with knots. 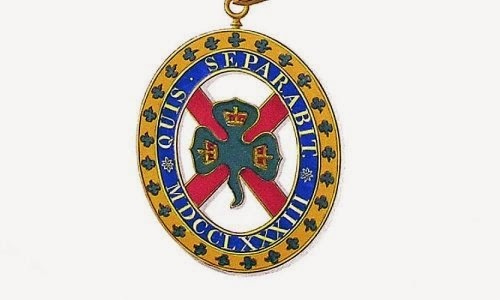 For royal jewel lovers like us, one specific version of the insignia of the Order of St. Patrick is of special interest. In 1830, William IV had a new set of insignia made for the Lord Lieutenant of Ireland, who was also the Grand Master of the Order of St. Patrick. The star was made of 394 diamonds taken from the jewelry that had belonged to the king's late mother, Queen Charlotte, and from one of the badges of the Order of the Bath that had belonged to his late father, King George III. The insignia pieces also included rubies and emeralds, and they were significant enough that they were sometimes called the "Irish crown jewels." To give you an idea of how significant diamonds from Charlotte's collection really are, allmost no jewelry exists in the British collection today that dates back to Queen Charlotte. This is, in part, because of a suit filed by the Hanoverian royal family in the 1830s; in 1857, they were granted a number of pieces of Charlotte's jewelry, including her small nuptial crown. (One of the only pieces of jewelry in the current Windsor collection that includes diamonds that once belonged to Queen Charlotte is Queen Adelaide's fringe necklace/tiara, sometimes called the "Hanoverian Fringe." Hugh Roberts speculates that the Hanoverians simply overlooked it.) Unfortunately, the St. Patrick insignia that included some of her diamonds has been MIA for more than a century. The insignia was stolen from Dublin Castle in 1907, just before Edward VII was to make a visit to Ireland, and it has never been recovered. What happened to the jewels remains a mystery to this day. As you might have expected, the Order of St. Patrick has been dormant since roughly 1922, at the time when Ireland was partitioned and the Free State was granted independence. But there actually were knights of the order created after that date. Three British princes, all sons of George V, were made members in the ensuing years: the Prince of Wales (later Edward VIII) in 1927, the Duke of Gloucester in 1934, and the Duke of York (later George VI) in 1936. Bertie, the last knight to be created, was invested on St. Patrick's Day in 1936. He was the only person added to the order by his elder brother during his brief reign, and the last person ever added to the roster by any monarch, period. The last living member of the order was Prince Henry, Duke of Gloucester, who died in 1974. (Well, that's the last person invested as a member -- as the order has never actually been abolished, it still has one member today: its sovereign, Elizabeth II). Every now and then, the idea of reviving the order is bandied about by members of the Irish government, although the obstacles to restarting a British order of chivalry in Ireland today is fraught with some obvious concerns. With the weight of a tragic and complicated colonial past hanging over it, I think it's likely that this is one of so many chivalric orders that is a permanent part of history. 2. Cropped version of an image available via Wikimedia Commons; source here. 3. For much more on the original creation of the order, see this book on the order's statutes, ca. 1852. 4. Here's an example of a St. Patrick star that was sold recently at Christie's; it was originally owned by the 1st Marquess of Clanricarde and ended up in the collection of the 6th Earl Harewood, husband of Princess Mary, Princess Royal and Countess of Harewood. It sold for more than $14,000. 5. "Quis separabit?" 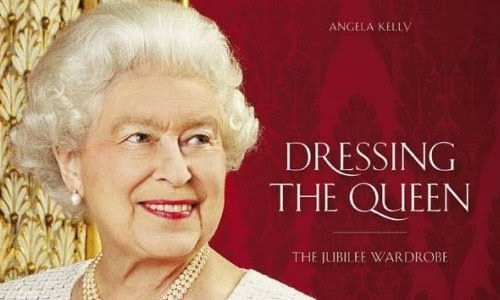 is also the motto of numerous military regiments, including the Irish Guards (who are being visited today by the Duke and Duchess of Cambridge). And, trivia fact for the Americans among you, it's also the motto on the seal of the state of South Carolina (which seems sort of ironic, no?). 6. These occasions were the order's "collar days." Some of them were regular (Anglican) religious festivals: four days in the Easter Season, Pentecost, New Year's Day, Epiphany, Candlemas, the Feast of the Annunciation, All Saints' Day, and Christmas Day. And then there were a number of saints' feast days: St. Patrick, of course, plus St. Matthias, St. David, St. George, St. Mark, Sts. Philip and James, St. John the Baptist, St. Peter, St. James, St. Bartholomew, St. Matthew, St. Michael the Archangel, St. Luke, Sts. Simon and Jude, St. Andrew, and St. Thomas. And, finally, there were days related to UK and royal holidays: the birthdays of the King and Queen, the monarch's accession day, the day of the monarchy's restoration in 1660, and -- intriguingly -- Guy Fawkes Day. 7. Cropped version of an image available via Wikimedia Commons; source here. 1. 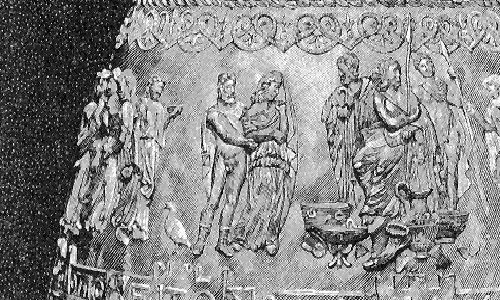 Cropped version of an image in the public domain due to its age; source here. 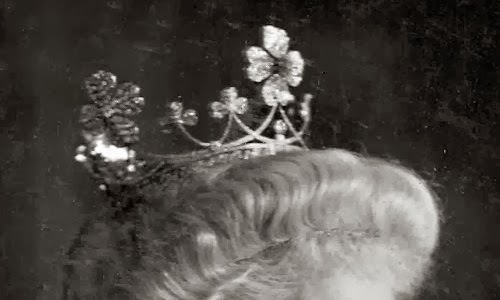 There are many convertible diamond fringe tiaras in royal vaults today, but the fringe tiara of the Connaught family has a long royal history — longer than that of many other tiaras in the collections of various British royals. The first recorded owner of this diamond fringe is the Duchess of Kent, mother of Queen Victoria; she left the tiara to the queen. 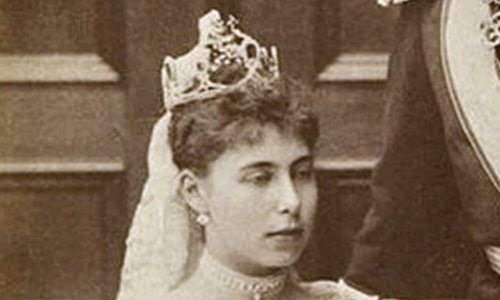 In 1879, Victoria gave the tiara as a wedding present to her new daughter-in-law, Princess Louise Margaret of Prussia, the new of Prince Arthur, Duke of Connaught and Strathearn. 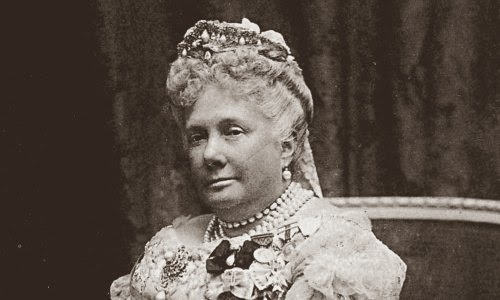 Princess Louise wore the fringe as a necklace at her wedding, opting to wear a wreath of flowers on her head instead of a tiara (see the photograph at left). She donned the piece as a tiara, however, for one of the most important royal occasions of the early twentieth century: the 1902 coronation of her brother- and sister-in-law, King Edward VII and Queen Alexandra (see the photograph above). 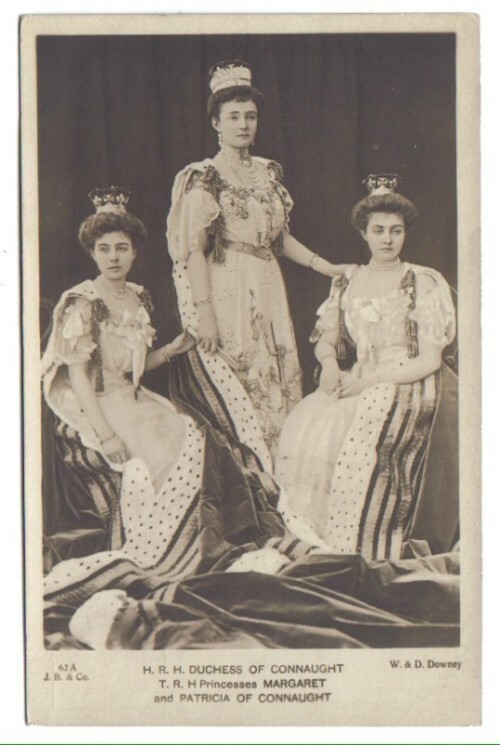 On that occasion, she placed the fringe atop a larger jeweled base to give it additional height, likely to complement the height of her coronet (which you can see with the tiara in this picture postcard -- it also features her daughters, Margaret and Patricia). 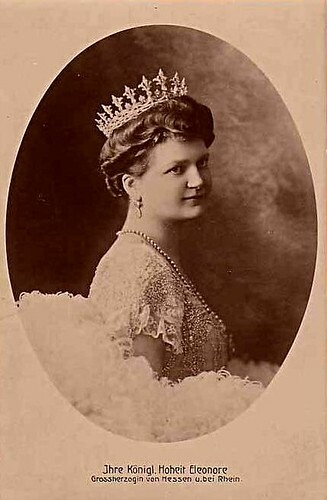 From Louise Margaret, the tiara was passed to her younger daughter, Princess Patricia of Connaught (who renounced her titles on her marriage to a commoner, becoming Lady Patricia Ramsay). It’s safe to say that Louise’s elder daughter wasn’t much in need of family tiaras to wear. 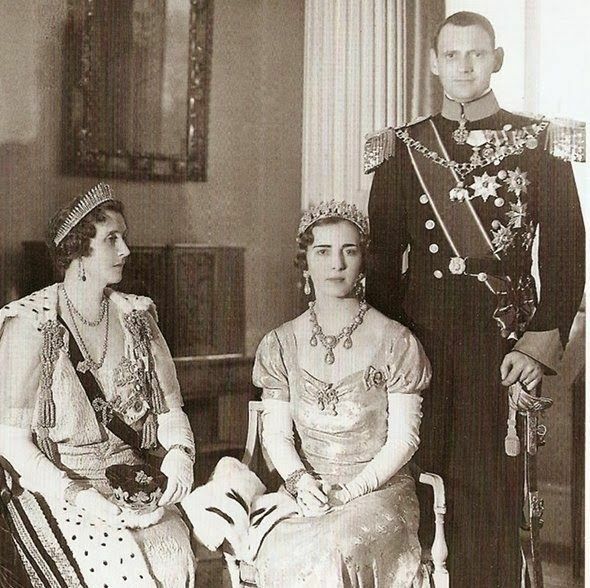 Margaret had married the future King Gustaf VI Adolf of Sweden and had access to the Bernadotte jewel collection (and the glittering wedding presents she had received in 1905). 1. Cropped and edited version of an image in the public domain; source here. 3. A version of this post originally appeared at A Tiara a Day in March 2013. 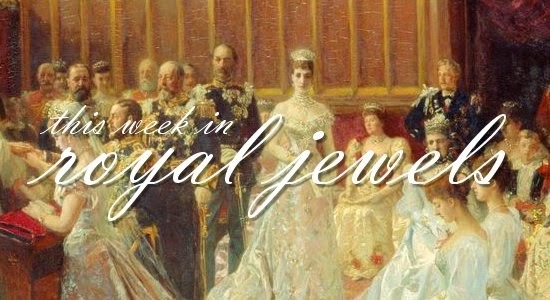 The Windsors dominated this week's jewel news -- with the exception of one very sparkly surprise from Denmark. Enjoy this week's jewel news, now with more photos! 10. Queen Sofia of Spain chose pearls and a gold brooch for an "In Memoriam" tribute concert in Madrid on Wednesday. 9. Crown Princess Victoria of Sweden celebrated her name day on Wednesday with a pair of modern silver earrings and an especially adorable guest: Princess Estelle. 8. On Wednesday, Queen Elizabeth II chose her ruby and gold floral brooch for a visit to the Royal Commonwealth Society. The brooch may have been one of her wedding gifts, possibly from the people of Monaco. 7. Crown Princess Mary of Denmark wore low-key jewels on Sunday during a visit to New York, where she attended a dinner hosted by the Consul General of Denmark. 6. The Duchess of Cornwall wore her four-strand pearl necklace, reportedly a Parker-Bowles family heirloom, at a service at Westminster Abbey honoring the late Sir David Frost. (Other royals and royals-adjacent also attended, including the Countess of Wessex, Princess Beatrice, Lady Sarah Chatto, Viscountess Linley, Crown Princess Katherine of Serbia, Pippa Middleton, and Sarah, Duchess of York, who ably channeled the Flying Nun for the occasion.) Camilla wore the same jewels at the Abbey earlier in the week for the Commonwealth Observance Service. 5. On a visit to Peru on Friday, Queen Maxima fancified a casual daytime look by adding a brooch from the Mellerio ruby parure. 4. Queen Mathilde of the Belgians was welcomed to Buckingham Palace by various members of the Windsor family on Thursday; she wore sparkling pearl and diamond earrings for the occasion. 3. At the Commonwealth Observance Service, the Queen wore one of her most frequently-sported brooches: the Frosted Sunflower, made for her in the 1970s by Garrard. 2. Continuing her celebration of Commonwealth Day, the Queen sparked a bit of a jewel mystery when she wore this unidentified brooch to a reception at Marlborough House. St. Patrick's Day is nearly upon us -- what better time to take a gander at royal jewels that feature shamrocks, clovers, and trefoils as a part of their design? We may not see many new pieces of royal jewelry today that incorporate these motifs, but the Victorians loved a good shamrock. And why not — the shamrock is not only used as a symbol of Ireland but also seen as a representative of the trinity and of other sacred trios. Here are a couple of my favorite pieces of jewelry that feature this lucky symbol. For my money, one of the most charming kokoshniks out there is this tiara, which is made up of tiny shamrocks or trefoils. The piece also comes from the collection of the former imperial family of Germany. 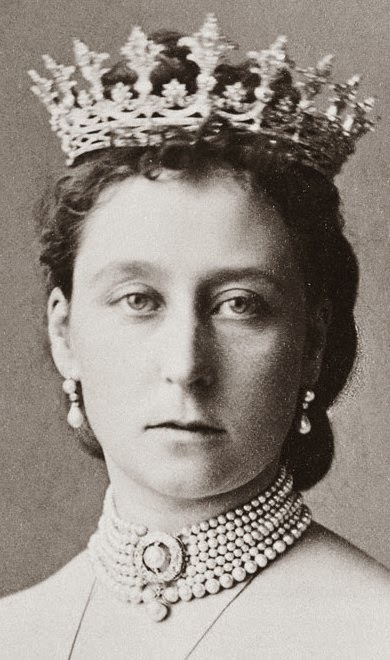 The tiara, which was made by Fabergé, can also be worn with three detachable elements to supplement the design. It was given as a wedding present to Cecilie of Mecklenburg-Schwerin, the wife of the last German crown prince, in 1905. Her daughter, also named Cecilie, wore it at her wedding to Texan architect Clyde Harris in 1949. Ursula's site features additional pictures of the piece. When the Duchess of Cambridge makes a visit to the Irish Guards, she borrows a gold shamrock brooch from them to wear for the occasion (see the photograph above). The piece has a teeny-tiny emerald set right in the center of the shamrock leaves, giving it a bit of glitter as well as shine. Kate has worn the brooch on three separate occasions so far (and likely will wear it again on Monday); in the past, the regiment has also loaned the brooch to the Queen Mum and to Princess Anne. The Albion Art Institute in Tokyo today owns this trefoil-motif tiara, which once belonged to a member of the French imperial family. 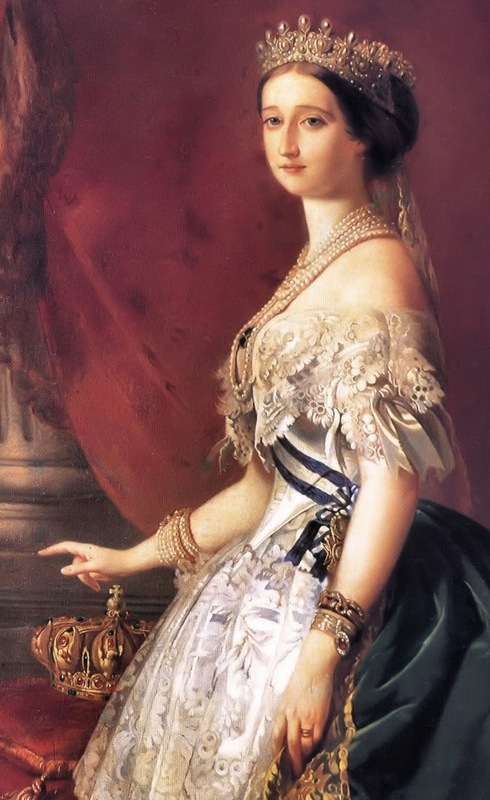 Napoleon's adopted daughter, Stéphanie de Beauharnais, was probably the first owner of the piece, which is made of pearls and diamonds set in gold and silver. Her granddaughter, Princess Marie, married the Count of Flanders, a son of King Leopold I of Belgium; she's the wearer who is most frequently associated with the tiara. 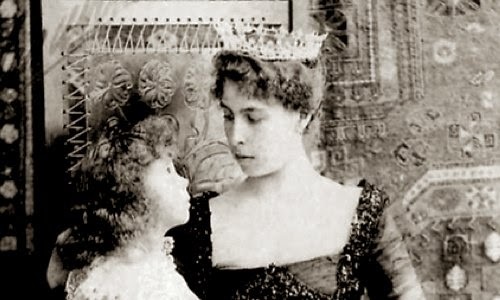 Marie's daughter inherited the tiara, but it eventually left the family altogether. Since it was acquired by Albion Art, it's been included in a number of exhibitions all over the world, including the "Diamond Divas" exhibit in Belgium . 3. Here's an item on the Flanders tiara from the exhibition. 4. Cropped version of a photograph in the public domain; source here. The marriage of Miss Virginia Bonynge , daughter of the California millionaire, Charles W. Bonynge , to Viscount Deerhurst , took place in the Church of All Saints, Kensington, at 2:30 PM today. The weather was perfect. Large crowds of men and women were attracted to the vicinity of the church to catch a glimpse of the bride and groom and study the magnificent costumes of the bridal party. The church was well filled with guests, among whom were the Princess Christian , Princess Victoria of Schleswig-Holstein, the Countess of Arran, the Countess of Cairns, the Earl and Countess of Cadogan, the Earl and Countess of Essex, the Earl and Countess of Craven, Lord and Lady Burton, Mrs. Bradley Martin, Gen. and Mrs. Byron, and many others. The wedding gifts were numerous, costly, and magnificent. The gift of Prince Duleep Singh  was a diamond bracelet with enamel links, and that of Prince F. Duleep Singh a diamond pin and a pearl brooch. The Earl of Coventry gave a service of silver plate and a pearl necklace, and a pearl and diamond bracelet were presented by the Earl and Countess of Coventry. Mr. Bonynge, the father of the bride, gave his daughter a diamond tiara, a diamond bracelet, a silver tea and coffee service, and a check for a large sum of money. 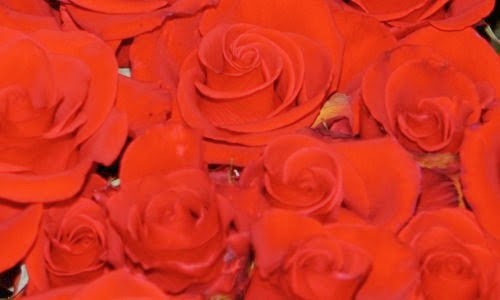 Besides the presents mentioned, the bride received many others, all of which were of great value and exquisite design. 1. Image published in 1904 Lady's Realm, a monthly women's magazine; see the issue here. 2. 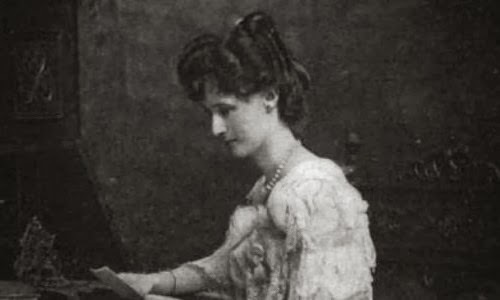 Lady Deerhurst (1866-1948) was born Virginia Lee Daniel, the daughter of William Daniel and Rhoda Stephens. Her parents divorced, and her mother married Charles William Bonynge in 1869. She used her stepfather's surname after the marriage. Prior to her marriage to Lord Deerhurst, Virginia was apparently briefly engaged to the Hon. Ronald Greville (whose eventual wife, Margaret, left a fortune's worth of jewelry to the Queen Mother on her death). 3. Charles William Bonynge (1838-1913) was born in Ireland, but made his fortune during the gold mining boom in California. He was involved in a rivalry with John Mackay, the husband of one of Boucheron's best customers. 4. George William Coventry, Viscount Deerhurst (1865-1927) was the eldest son of the 9th Earl of Coventry and Lady Blanche Craven. He died three years before his father, so his elder son, George, became the 10th earl. 5. 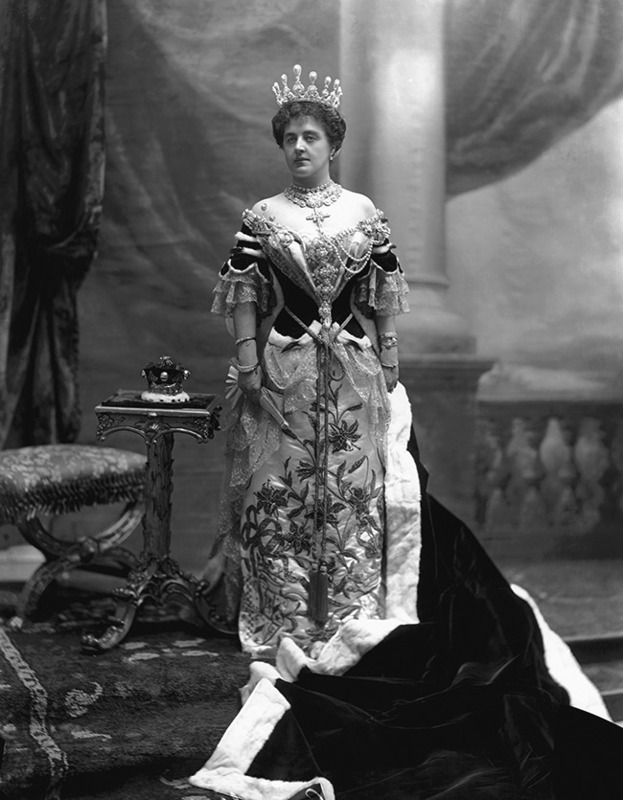 Princess Helena, the fifth child of Queen Victoria and Prince Albert; according to a 1903 issue of the San Francisco Call, she was Lady Deerhurst's close friend and sponsor in society. 6. Prince Victor Duleep Singh, son of the Maharaja of Lahore, was married to Lord Deerhurst's sister, Lady Anne Coventry. "Prince F. Duleep Singh" is his younger brother, often called "Prince Freddy."